A key selling point to any halfway decent zombie apocalypse story is wish fulfillment, namely, the permission to deliver a series of concussive head shots to the anonymous masses without having to suffer even the slightest pangs of moral ambiguity. Therefore, it stands to reason that one of the main features of the newly developed Walking Dead: Battle For Survival theme park ride will almost certainly be the opportunity for guests to shoot down animatronic reanimated corpses. The “mixed media” ride, which was just revealed at the International Association of Amusement Parks and Attractions convention in Orlando, Florida, was designed by Sally Corp., a ride and animatronic manufacturing company based in Jacksonville, Florida. 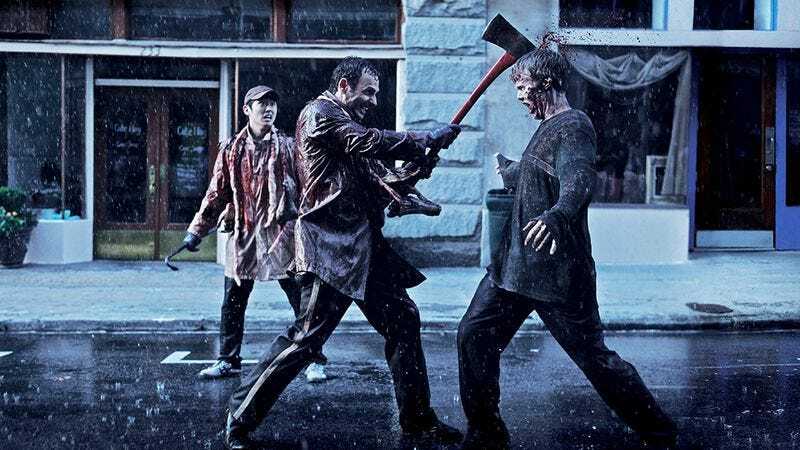 It has yet to find a buyer or ultimate location, but considering the immense popularity of the gore-filled AMC drama on which it’s based, that should all be worked out soon enough. The fall-of-humanity-themed ride will roll thrill-seekers through a series of familiar locations and past well-known characters, as well as a goodly number of zombies that will be brought to life (so to speak) through a combination of 3-D projection and animatronics. Since many of Sally Corp’s recent rides provide patrons with interactive laser guns, a similar feature seems like a no-brainer (no pun intended) for a flesh-eating, walker-filled ride.